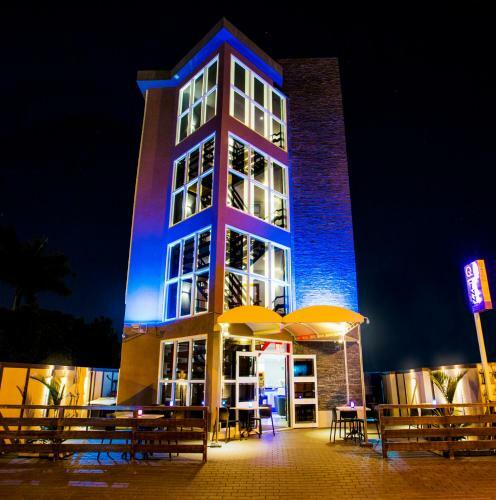 Lock in a great price for Q-Inn Boutique Hotel – rated 8.3 by recent guests! The hotel was as advertised and the location is good. The bedding is always ridicously very comfortable. The water and shower is great. From the outside it look amazing at night with the lights. Very comfortable beds, clean room, Ron-Ron and the staff were friendly and made everything easy. The owner Ron Ron’s entrepreneurial spirit and passion came through in his staff as well. this hotel was very clean The staff was very very helpful some may find the room small but OK for me The only problem it is a rough part and I could not walk to any place However the staff and been very clean made up for that. 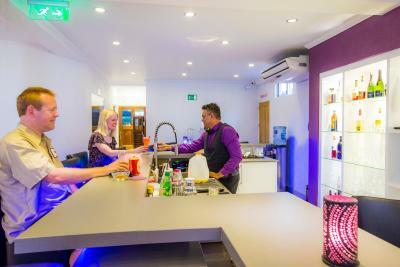 We really liked the way the staff treated us with a very warm welcome and very friendly. Especially Mr. Ronald, who helped us during our stay with anything we needed. Amazing place for the price it's offered! Yes, we do recommend Q-Inn for couples like us! Excellent location, Amazingly helpful and friendly staff who always assisted me with a smile, unbelievable view from my room, and NETFLIX for my evenings. Staff was great, very helpful in their suggestions of places to visit. Can't beat the location to major sites within walking distance or a cheap $1-2 cab ride everywhere. Drinks at the bar were amazing as well. I must say that the three days spent at this hotel was the very best. The staff and the boss were very amiable, they did absolutely anything to make my girlfriend and I comfortable. The rooms were exactly like the pictures, the breakfast was amazing, the hotel even went out of their way to prepare a vegetarian breakfast for me, which was delightful and heavily appreciated.With such a short walking distance to town, we had no problem walking around to see the different landmarks and doing a little shopping. 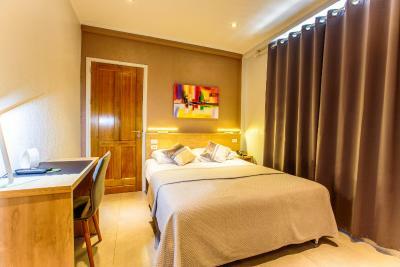 You're getting your money's worth with this hotel, and it's safe to say that whenever I visit Paramaribo again i will definitely be staying there. Q-Inn Boutique Hotel This rating is a reflection of how the property compares to the industry standard when it comes to price, facilities and services available. It's based on a self-evaluation by the property. Use this rating to help choose your stay! 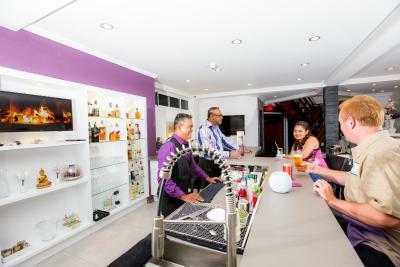 One of our top picks in Paramaribo.Set in Paramaribo, 1.1 mi from Paramaribo Central Market, Q-Inn Boutique Hotel features free WiFi access and free private parking. 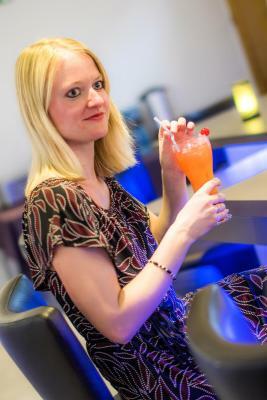 Guests can enjoy some cocktails in the on-site bar with a terrace. The property is set 1.1 mi from the Central Market. 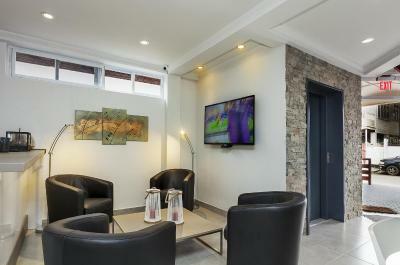 Every room has modern decoration and is fitted with a flat-screen TV. Some units have a seating area to relax in after a busy day. 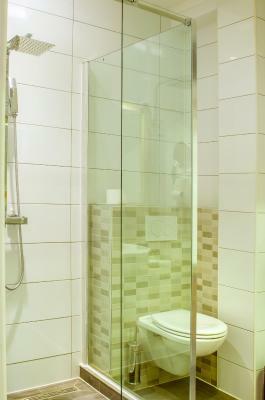 Every room has a private bathroom equipped with a shower. For your comfort, you will find a laptop safety box, free toiletries and a hairdryer. Bike hire and car hire are available at this hotel and the area is popular for cycling. A buffet breakfast is offered every morning. St. Petrus and Paulus Cathedral is 0.6 mi from Q-Inn Boutique Hotel, while Waterkant is 0.9 mi from the property. 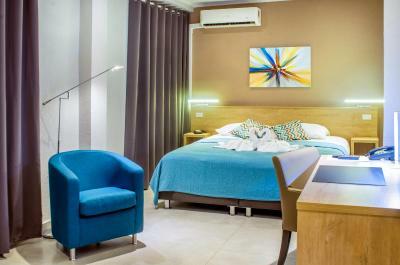 The nearest airport is Johan Adolf Pengel International Airport, 27 mi from Q-Inn Boutique Hotel. 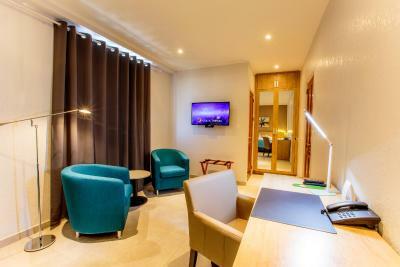 When would you like to stay at Q-Inn Boutique Hotel? This double room has a tea/coffee maker, soundproofing and seating area. There is no capacity for an extra bed. 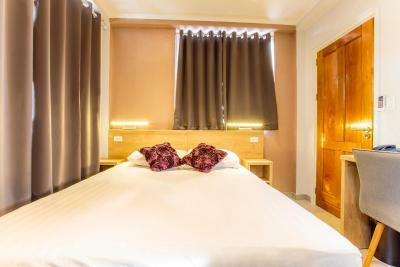 This double room features a seating area, air conditioning and private entrance. An extra bed is available upon request. 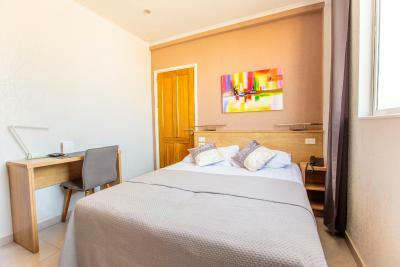 This double room has air conditioning, tile/marble floor and seating area. There is no capacity for an extra bed. 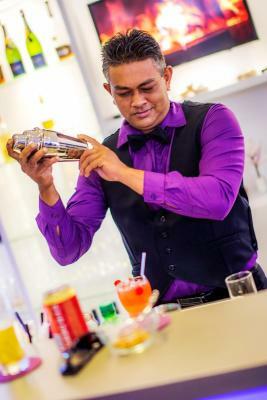 House Rules Q-Inn Boutique Hotel takes special requests – add in the next step! Q-Inn Boutique Hotel accepts these cards and reserves the right to temporarily hold an amount prior to arrival. Guests can pay by cash and creditcard (Visa and Mastercard) in the hotel. Please note Family Rooms (interconnected Superior Rooms) are available on request. Please contact the property. The hotel might contact you via Booking.com to ask you to confirm your reservation. 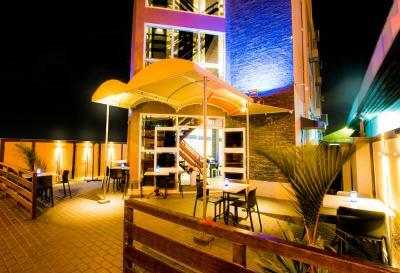 Q-Inn Boutique Hotel would like to receive your confirmation email within 7 days. In some cases, you will be asked to make a down payment of 10%. Please inform Q-Inn Boutique Hotel of your expected arrival time in advance. You can use the Special Requests box when booking, or contact the property directly using the contact details in your confirmation. The bed was a bit small and was not as expected. 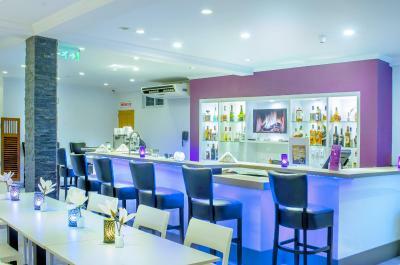 The hotel has a bar but you are not allowed to use your own drinks or food if brought by friends on the property terrace. This should change. 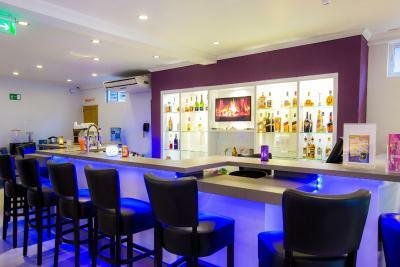 Perfect hotel to stay in Paramaribo. Personal is very helpfull. They really try to help you with your questions. Close enough to the city center, but quiet rooms. They dont take Visa credit cards. Some locals said neighborhood is not safe. Not completely true. As safe as any place in the world. Just be cautious, have common sense. Friendly staff. Visa cards are not working in Suriname, they waited for me until I could solve the situation. They offered to pay my taxi to my work and even offered lend me money for lunch. Unbelievable! The immediate streets around were narrow and a little dark at night. 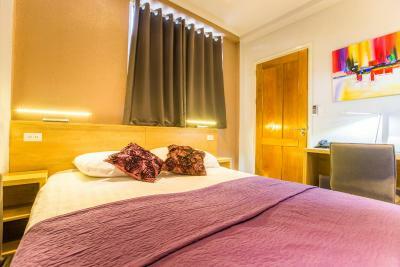 Comfortable and modern stylish hotel, a short walk from the city centre. The staff were very helpful and arranged a taxi from the airport and a shared taxi to the border. It is a small and quiet hotel. 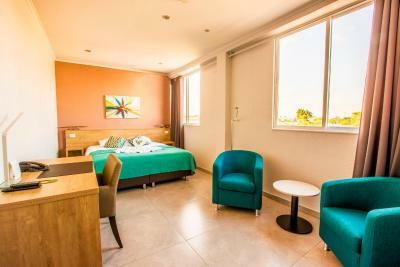 The rooms are modern and clean, have good beds and the airco's are perfect. The staff is making you feel at home. Wonderful very friendly and helpful staff - from owner on down. They could not do enough for me to make my stay pleasant and comfortable. 3-year old modern hotel - all facilities are tip top and everything works. Good size room and bathroom. Property is at the north-eastern edge of the center - about 10 minutes walk to the very center of the town. St. Peter and Paul Basilica, Presidential Palace, Waterfront (nothing to get excited about! 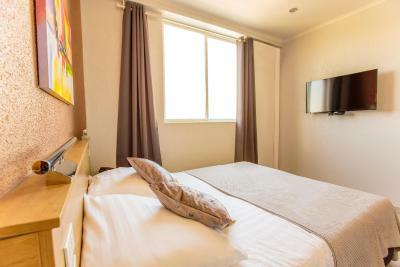 ), Fort Zealandia and the upscale hotels and casinos area are within easy walking distance. Expensive cost for the taxi to the airport booked from the front desk. The matress in the bed was actually two matresses and you fall down in the gap between if you move. No fridge in room. Room is good for 1 person but might be a little tight for 2 persons. Shower only had a partial partition so the bathroom floor gets wet after bathing. Staff very friendly, engaging and understood English. Room was super cute. There was a work table and closet. Many bathroom amenities: shaving mirror, extra lights. The windows did shut but sounded like they werent shut all way, which made the barking neighbours dog sound loud and annoying. Staff was very helpfull and had good tips and tricks. The room was too small it's tiny. The bed were twin beds, was a gap between them. The bed was located with the AC blowing in your face. The bathroom was tiny also.